Dr. Jovin joined the Division of General Internal Medicine in 2003 as part of the Hospitalist Attending Service, and assumed a leading role as Director of Hospital Medicine in developing a Hospitalist Program at UPMC Presbyterian/Montefiore. 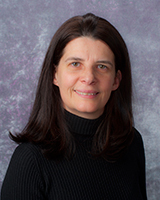 She was Core Faculty for the Junior Hospitalist rotation and Adult Acute Care Nurse Practitioner clerkship. Dr. Jovin is involved in the teaching of medical residents and students. Her areas of interest are Development of the Inpatient Medical Services, Improved Physician Communication, and Development of Protocols and Pathways that Improve Inpatient Care. Dr. Jovin sits on several hospital committees and most recently became vice president of Medical Affairs at UPMC Presbyterian Hospital.